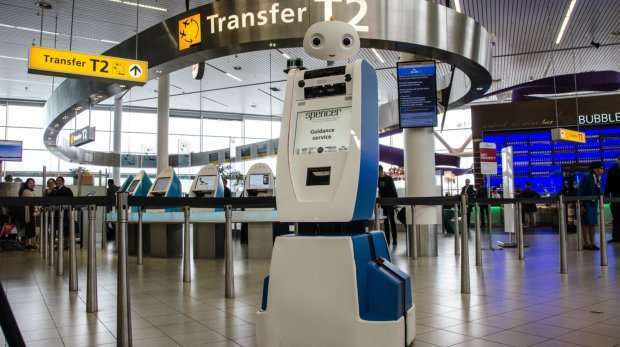 After three years of building and programming, the first tests using guide robot Spencer were successfully conducted at Schiphol airport this month. The test phase was completed last week. 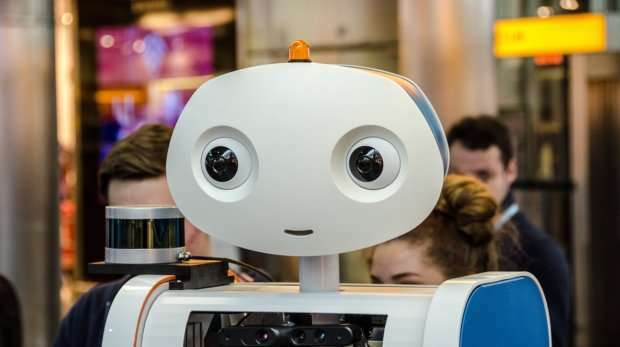 Spencer, developed in cooperation with the University of Twente, has guided KLM passengers to the right gate at Schiphol airport for the first time. The robot has access to detailed maps of the airport and laser eyes that allow it to measure distances for example. Once Spencer has scanned passengers' boarding passes, he knows that the group is complete and to which departure gate they have to be escorted. Spencer will automatically leave and the passengers follow the robot. 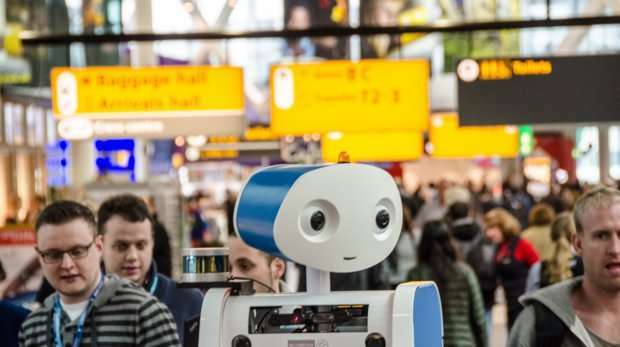 The robot adjusts its speed to the group, moves past obstacles and informs passengers of the remaining distance to the departure gate via a screen. Once there, he will inform them that they have reached their destination. Professor Vanessa Evers' department of Human Media Interaction in the CTIT (Centre for Telematics and Information Technology) institute of the Faculty of EEMCS, is currently conducting research into the types of behaviour exhibited by the Spencer robot that are deemed socially acceptable by passengers. Spencer has to be able to recognize groups of people, has to take group behaviour into account and has to have the ability to recognize obstacles such as luggage carts. Spencer will also have to be proactive in unforeseen circumstances. 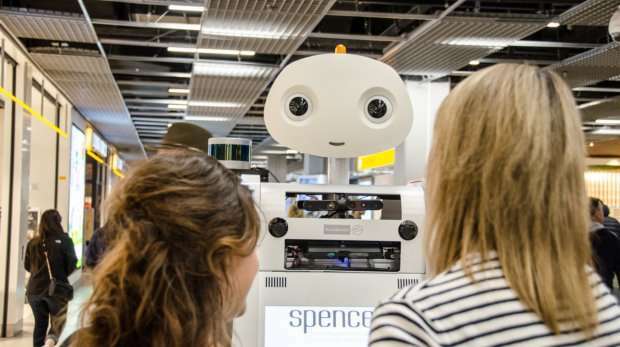 "When we refer to Spencer's behaviour we mean the speed at which the robot travels, the distance between him and the groups he is with, and his attitude in social situations at the airport", says University of Twente PhD candidate Michiel Joosse, who is helping to develop the robot. "For example, the robot has to wait until a large group of people has passed by or it has to check if the people who are supposed to be following it are still close. Completing the test phase is an important step in our research." According to René de Groot, Chief Operating Officer at KLM, robotics will have a great impact on aviation in the coming years. "Every day, passengers miss their connecting flights due to delays, problems finding their way around the airport or language barriers. Because 70% of KLM's passengers change planes at Schiphol airport, we are looking into how this process can be further improved. We are investigating how robotics can fit into this process."